In a few short weeks I will be cleaning up my room, saying goodbyes and packing away my hot pink scrubs for one final time. I will leave Philadelphia as I have many times over the past two years, but this time it will not be round trip. 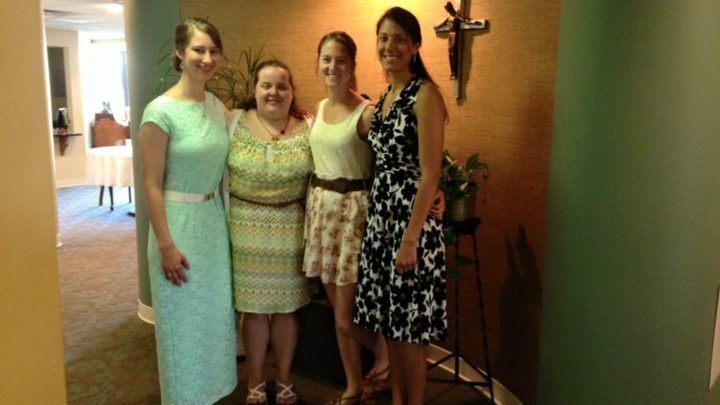 I will no longer spend my Sundays celebrating Mass and enjoying lunch with the Sisters, Associates, and fellow RMCs. I will no longer spend my Mondays and Tuesdays fighting the traffic on my way to Drueding Center. I will no longer spend my Wednesdays- Fridays amidst staff and patients who constantly teach me about the ups and downs of life. Yes, in a few short weeks, everything is going to change. It is a change that is welcomed but also dreaded, as it brings a chapter of my life to a close but also paves the way for the road ahead. So, as I take the time to reflect on the journey of the past two years it is not without a sense of tremendous gratitude for what I have experienced as well as deep joy for the relationships I have formed and looming sorrow for what I am about to leave behind. Living a life participating in full-time service is hard. You have to motivate yourself to go to ministry on the toughest of days without even the minimum wage paycheck to reward you. You have to find a balance between being a member of the staff and completing all of your assigned responsibilities while also keeping in mind that you are there for ministry not employment. You have to empty yourself in full service to those around you while accepting that sometimes there may not always be someone or something to fill you back up. It is exhausting. It is challenging. It is draining. It is beautiful. The challenges of participating in year of service are many, but together they provide countless life lessons, blessings, and, of course, memories. For the past year I have been working as a Family Support Specialist at the Drueding Center, a transitional housing center for women and children. This position certainly tested me in many ways. It took me out of my comfort zone, challenged me to make the mundane meaningful and taught me about being resourceful, advocating for yourself, and finding balance. It awarded me the opportunity to find hope, meaning, and determination amongst a population that has experienced more than I could ever imagine. I was able to witness the unceasing compassion and advocacy that exists at Drueding and consider myself greatly blessed to have been a part of something so life-changing. My time at Drueding reminded me that service is not necessarily about what you want to do and when you want to do it but rather it is about willingness—about being able to fill the greatest need and to use the skills God blessed you with. I greatly admire all the staff that have put forth endless support to these families and I respect all the women who are putting in a lot of hard work to better their lives even when the odds seem stacked against them—they possess a strength and courage that is unmatchable. In my time as a Patient Care Assistant on 2 South I have been truly blessed in innumerable ways. I can honestly say that if you asked me 5 years ago what I would be doing after graduation, one of the last answers I would have given is toileting, bathing and feeding patients, or guarding a confused patient from jumping out of bed. So, first and foremost, this experience has been a tremendous exercise in humility. I have interacted with people when they are at their most vulnerable moments: sick, lonely, dying. I have comforted family members after their loved ones passed; I have rejoiced with patients when they hear the word discharge; whether we exchange words or not, we have become a part of each other’s lives, if only for a moment. And in that moment they have taught me patience, compassion, and strength. They have taught me how to love, even when it is difficult. They have given me an opportunity to serve in an organic and meaningful way and have taught me how to embrace life with hope, humor and humility. It has been a true blessing to experience the wisdom, beauty, fortitude and spirit of these individuals. Relationships have driven every facet of my time on 2 South, but no relationships proved to be more enduring, embracing and irreplaceable as the ones formed with my second family. Every one of my coworkers welcomed me onto the team and taught me something remarkable. They have invested two years of their lives into making my experience worthwhile and for that I am forever grateful. I will never forget the laughter we shared, the memories that we made, or the love that we exchanged. They taught me about medicine, about teamwork, and about compassionate, patient-centered care—so many things that are enormously essential. However, the most important thing that transformed this position from healthcare into a second home had absolutely nothing to do with being on 2 South but with a four letter word that never fails to transcend even the most mundane work: and that is love. As I embark on my PA school journey, I know that each of them will hold a place in my heart and in my mind, encouraging me and inspiring me every step of the way. As I have illustrated, one of the best things about doing a year of service is the people you are doing it with. The coworkers, clients, and patients all play a significant role in transforming the year into something beautiful. But they aren’t the only ones. There are a few more unsung heroes. People that endure the journey with you. They pray with you. They strengthen you. They experience joy and hardship with you. They are your wings when you have forgotten how to fly. They are your community. They start as your peers, they become your friends, and, in the end, they are your sisters. In my case, that last one kind of brings an intended pun as I have been blessed with a community that extends past the four inspiring women I live with and includes the Sisters, Associates, and Friends of the Holy Redeemer. Over the past two years this community has left me with nothing less than an astounding sense of admiration, appreciation, and great joy. I truly don’t think words will ever be enough to thank each of them individually for the indent that they have made on my life, but I hope they know how much they will forever mean to me. Coming to Philadelphia was not really in my five year plan. I never intended to journey to Southeast PA. I never intended to fall in love with my ministries. I certainly never intended to stay two years. But, looking back I would not change a single moment. The Jesuits have a phrase that describes completing a year of service. They call it “Ruined for Life”. They acknowledge that once you commit to this journey, you will never be the same. And I don’t think anyone could say it better. Because of my time with Redeemer Ministry Corps I leave Philadelphia a different person. I leave having crossed paths with hundreds of people who changed me in ways both great and small. I leave inspired to continue serving and living for others. I leave knowing that I am loved greatly by this crazy little community in Huntingdon Valley, PA. I leave with tremendous gratitude for all that I have experienced. I leave truly “Ruined for Life”. And it was all worth it.